The day before yesterday, director John Bruno and Jim Cameron flew over the great blue Jacquinot Bay and its cradle of cloud-wreathed mountains. The fast-flowing rivers, stands of huge trees, shoreside villages, and sparkling blue waters have a land-before-time quality. Jim passed John a note with a single word on it: PANDORA. This morning we’re three miles (five kilometers) off Cape Jacquinot at the mouth of the bay. Six miles (ten kilometers) long and five miles (eight kilometers) wide, the floor of the bay drops off sharply into the 26,257-foot-deep (8,000-meter deep) New Britain Trench. The ship’s dynamic positioning system—tunnel thrusters in the bow and stern—holds us in place over the 3,281-foot (1,000-meter) contour. We’re fortunate to be here. For 11 months, these waters are dominated by the big waves of the southeasterly trades. Today, the ocean is a mirror. Jacquinot Bay is rimmed with jungle-covered mountains rising more than 3,281 feet (1,000 meters) in the equatorial sun. Indigenous Papuans of the South Baining tribe live in the coastal villages of Malmal and Pomio. There are nine rivers flowing down from the mountains and they release a rich stream of nutrients into the turquoise waters of the bay. Biologist and diver Charlie Arneson says that what makes the New Britain Trench different from other deep-sea trenches is its location next to a dense, tropical rain forest. 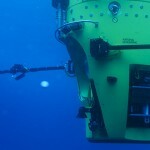 It’s likely that the organic matter drifting into the steep-walled trench provides the metabolic energy for unusual abyssal and hadal ecosystems. Charlie, who has made numerous scuba dives on the nearby virgin reefs, believes that the DEEPSEA CHALLENGER‘s lights and cameras will reveal a unique constellation of creatures. At 5:30 p.m., the DEEPSEA CHALLENGER is lowered into the water. An hour later, she’s already back on deck. At the postdive debriefing, Jim explains what went wrong. “We have a lot of little things we need to work out. It took too long to get the sub in the water and the heat from the electrical components, especially the Epic camera, turned the crew sphere into a furnace. When the boom camera hit the water, it stopped functioning. When the life-support system came off its strap and I had to hold it with my knee, I knew I had to come back.” We’re taking the time needed to fix these things and hoping to dive tomorrow. 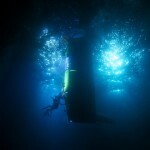 Filed under Expedition Journal and tagged 1000 meter dive, milestone, sub.